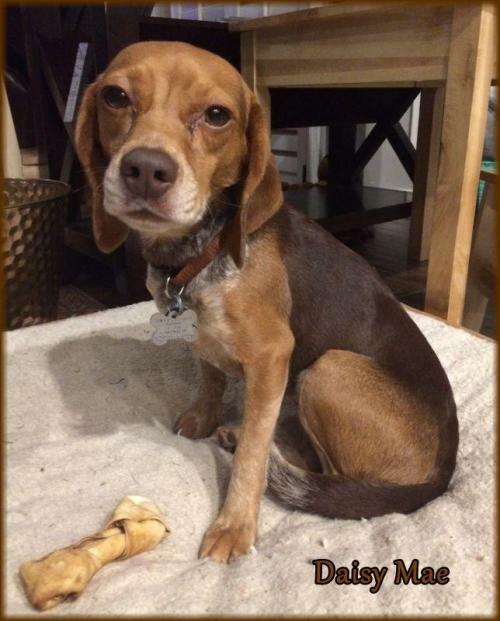 Description:UPDATE 1/27/16 from Daisy Mae's foster mom: Daisy Mae is a very laid back dog who will greet you at the door with a wagging tail! She has been coming around to coming when you call her and happy to be around humans. She loves attention when she approaches you and is a bit hesitant to children's quick movements. She will just move away to a quiet place. She has the MOST fun with her fur-siblings. She prefers the presence of other dogs and ignores cats. She is now 20 lbs, 2 years old, and has a beautiful soft coat. She has very unique coloring on her chest and tip of her tail. She has made tremendous strides in regards to trusting adults and I believe she will eventually come around to children, too. Meet DAISY MAE! She found herself in dire circumstances; she was picked up as a stray & taken to a crowded animal control facility in southeast Missouri. She was terribly frightened there & began to cower & shake in her cement prison. Hope faded from her as she realized she might not make it out alive. But Dolly's Legacy came to her rescue, knowing that this beautiful girl deserved a chance. Daisy Mae was rescued from the shelter and has blossomed in her foster home with all the love that is being showed upon her. 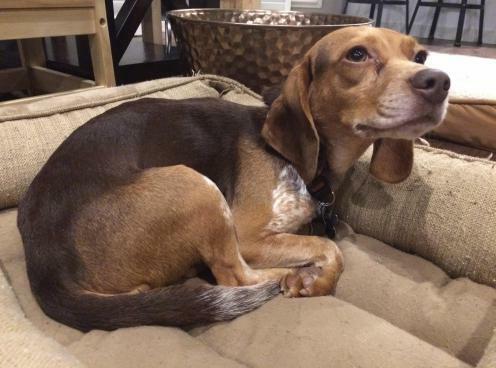 Not only did Dolly's Legacy save her from being killed at the shelter, but we are providing life-saving treatment for Daisy Mae to cure her of heartworm disease. Once completed in February 2016, she will be ready for a new chapter in her life by finding a family of her own. 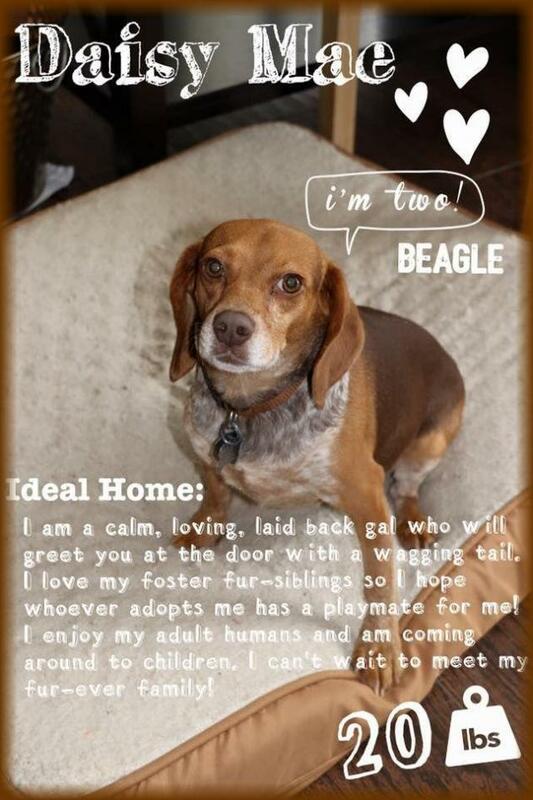 Daisy Mae is approximately 3-4 yrs old and a petite Beagle. Noisy homes frighten her, so a quiet home without young children or a lot of coming/going would be best for her. 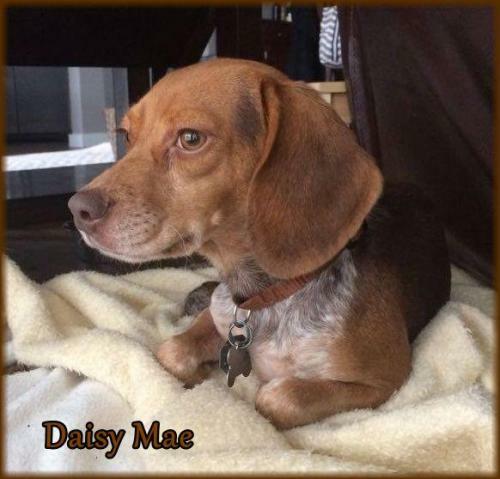 Daisy Mae is spayed, vaccinated, microchipped, given flea/tick preventative & dewormed. She is also undergoing heartworm treatment and will need to remain on Heartguard/heartworm prevention for the rest of her life. Adoption fee is $300 . For adoption guidelines and to submit an application, please go to this link: http://dollyslegacyanimalrescue.org/adopt/ We are a foster-home based rescue group and do not have a facility. The first step is to have you complete our online adoption application. All adoption appointments are scheduled after your application has been approved. We are 100% volunteers & will generally reply within 3 days of application submission. PLEASE be sure to answer all questions completely or it will delay processing, be sure to include vet phone#. If you have any questions please email DollysLegacy@aol.com. Please 'LIKE' our facebook page to learn more about our rescue, see more pictures & get updates on all our adoptable pets!